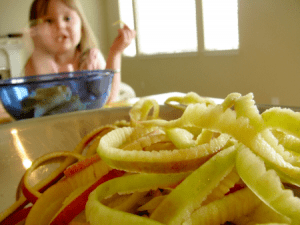 Apple Peels, Diabetes and Muscle Wasting: You might not want to peel that apple before eating it, let alone put an apple peel down the garbage disposal or in the trash container under the sink. Apple peels contains a good dose of ursolic acid. Ursolic acid is a natural compound found in apple peels called pentcyclic triterpenoid and helps to burn fat and build muscle. In a recent study in which mice were used, apple peel was shown to lower blood sugar levels, cholesterol and triglycerides. Ursolic acid is also known as malol, prunol, urson, 3-B-hydroxy-urs-12-en-28-oic acid. This study was conducted by Dr. Chris Adams, an endocrinologist and senior author of the study for the University of Iowa. The study showed that the ursolic acid found in apple peels could be helpful with the wasting away of muscles that occurs in certain diseases, and also possibly help with metabolic disorders like diabetes. The study results were published in the June 2011 issue of Cell Metabolism. The mice that received the ursolic acid became leaner and had lower blood sugar levels, cholesterol and triglycerides. Further testing will be needed before it is determined that the same positive results will prove to be true for humans. The muscle-building aspect of the ursolic acid would be beneficial in the treatment of the infirmed and elderly. Also, it is not known whether the amount of ursolic acid that is consumed on a daily basis by humans would produce the same results. Ursolic acid is found in apple peels, but it is also found in other plants, including bilberries, cranberries, hawthorn, prunes, elder flowers, lavender, oregano, thyme and peppermint. Ursolic acid has already been recognized as an inhibitor of various types of cancer cells. Ursolic acid is currently used by the cosmetic industry in the manufacture of cosmetics in its topical form due to its anti-tumor (skin cancer) properties. Type 1 and Type 2 diabetes diagnoses are growing in number each year. Every little piece of new information garnered that could help in the treatment of these conditions helps all those with these numerous conditions. In the meantime, we might want to do what we are always told: Eat your fruits and veggies. This entry was posted in Diabetes News on July 13, 2011 by admin.